Hiya guys. I apologize for not posting yesterday, I'm going through a bit of a rough patch right now. Without going into too much detail, my dog is very ill and today I'll be taking him to the vet. I'll try and keep you guys in the loop, but all I ask for now is a lot of prayers and good vibes. In an effort to take my mind off my troubles tonight, I decided to participate in a two challenge prompts. The first prompt is an Instagram one from The Nail Art Guild and it's 'Weather' (hashtag #TNAGweather and #thenailartguild). The other prompt was 'Fall Favorites' from the Hobby Polish Blogger group on Facebook. For those of you not familiar with the group, it's a fantastic group aimed towards helping new and veterans bloggers in our nail community. This design is inspired by Chelsea from The Nail Network and a design she did a few years ago. Of course, hers is a million times better so go check her out. I know some of you are probably thinking this mani isn't very fall-like. The whole purpose behind the prompt from Hobby Polish Blogger is our favorite thing about the Fall and for me that's the weather leading Fall into Winter. I love the slight sprinkling of snow, drinking hot chocolate, and curling up by the fire. It's the anticipation of the new season on the horizon and getting accustomed to the cold weather that makes the last few weeks of Fall my favorite time of year. 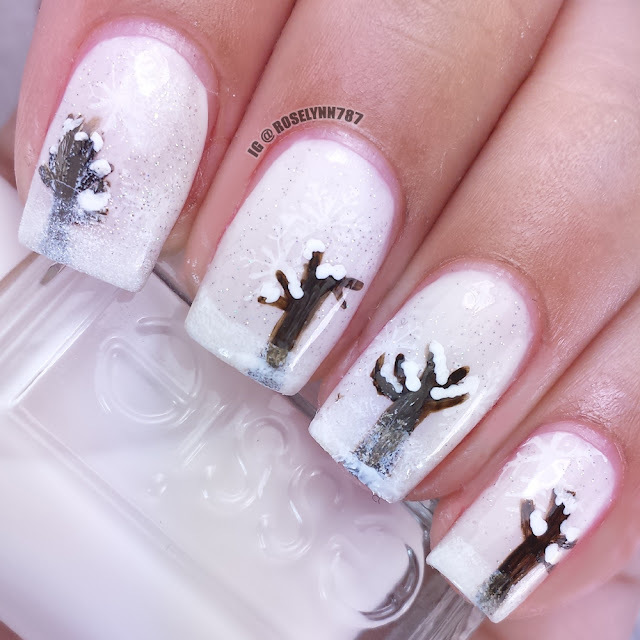 Goodbye leaves, hello snowflakes. Base polish is Essie's Tuck it in my Tux topped with China Glaze Fairydust. I also stamped some snowflakes with a white opaque polish and a Winstonia plate. The trees and snow are done freehand using acrylic paint and a small detail brush. 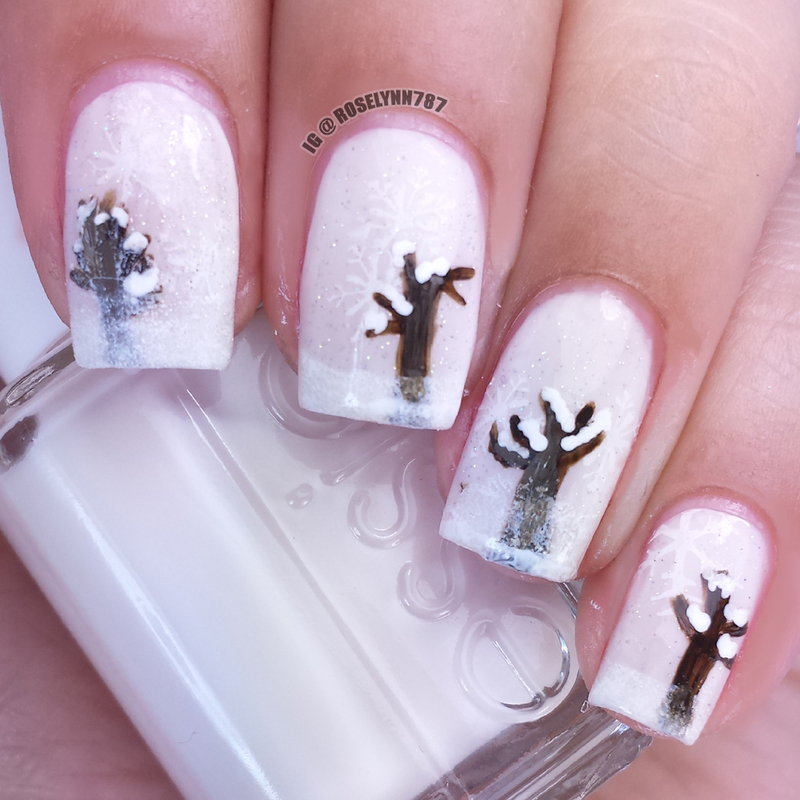 Using a makeup sponge I also did a snowy effect around the tips. Check out the other ladies participating in this month's Fall Favorites Prompt in the Hobby Polish Blogger Group down below. Thank you I really appreciate all the good vibes. I'm going to need it. Lovely mani! Lots of positive vibes and prayers for your dog!